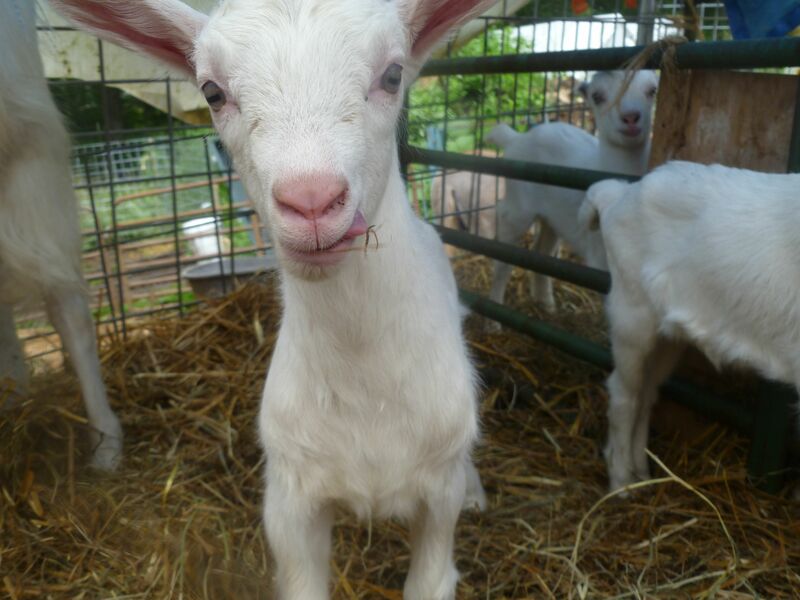 Now that our goatie babies are all over 2 months old, we are beginning to find new homes for them. They have been a constant source of entertainment and they are all sweet, sweet doelings. But keeping 4 of them would mean a serious population explosion, so we began looking for homes for two of them. One of Pippi’s short-eared girls and the long-eared girl who did not break her leg! 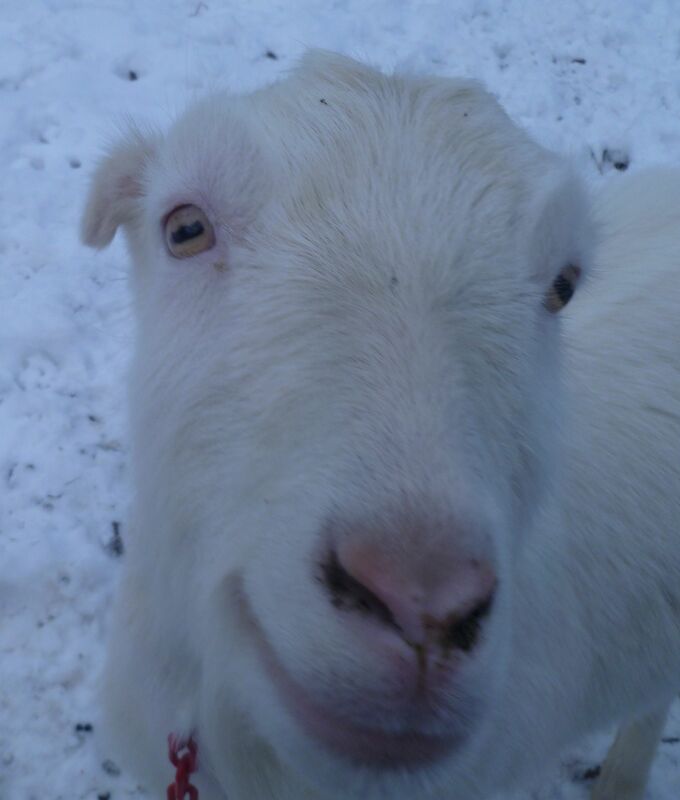 We also have an extra adult goat, Bonbel, that we had not really intended to keep. She is the one who had the long-eared girls this year. She has kidded twice, both times twins and both times with no problem. 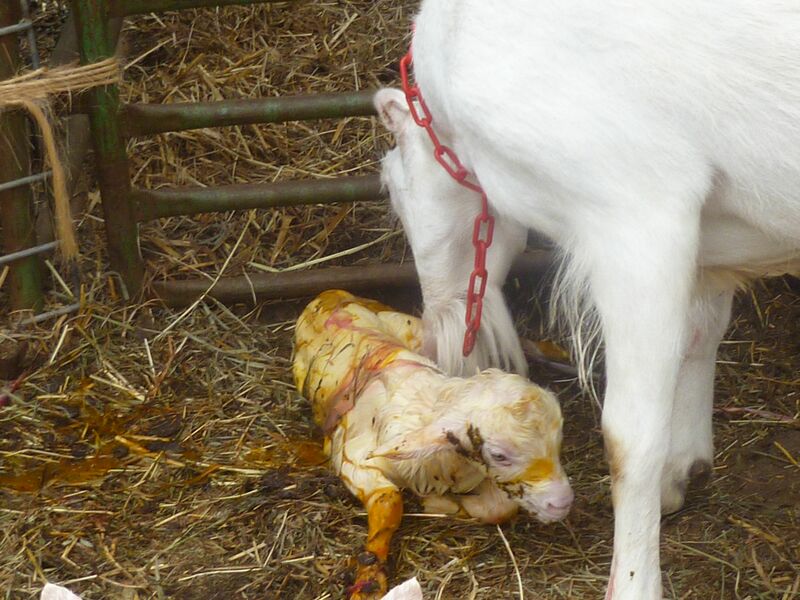 But I hand milk and only can deal with a certain amount of it, so I prefer to only milk two goats a year. Maybe 3 someday! 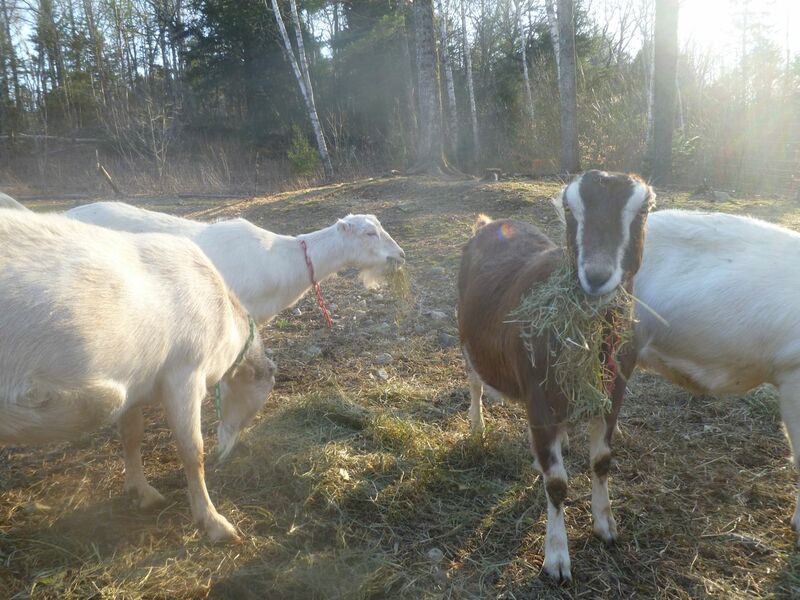 So we found out that a friend of ours was interested in her and we did a barter: she is helping me with trimming goat hooves and she gets a sweet girl who has a lot of milk to share. I am really pleased! Bonbel’s girl who has moved on to a family with children! 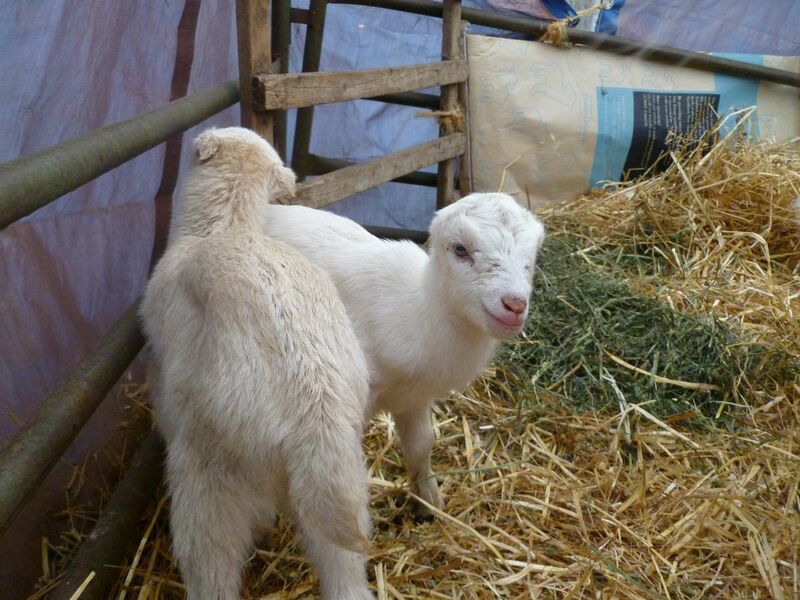 As for the goat babies, our friend who is taking Bonbel has found a family whose children have been saving up for goats, so they are taking an adult from our friend and two of our babies. One long-ear and one short-ear. Our friend Celine took the three of them off yesterday, and today has been a totally new chore time! The long-eared baby with the broken leg is still here with us and Bonbel her mother is gone, so she had a little bit of a tough time, but Zorro the llama cuddles up with her in the greenhouse, and I found her sleeping next to Pippi’s short-eared girl this morning. They are great friends and hang out together. SnowPea, our oldest doe and herd queen, also cuddles up with any of the babies and watches out for all of them. 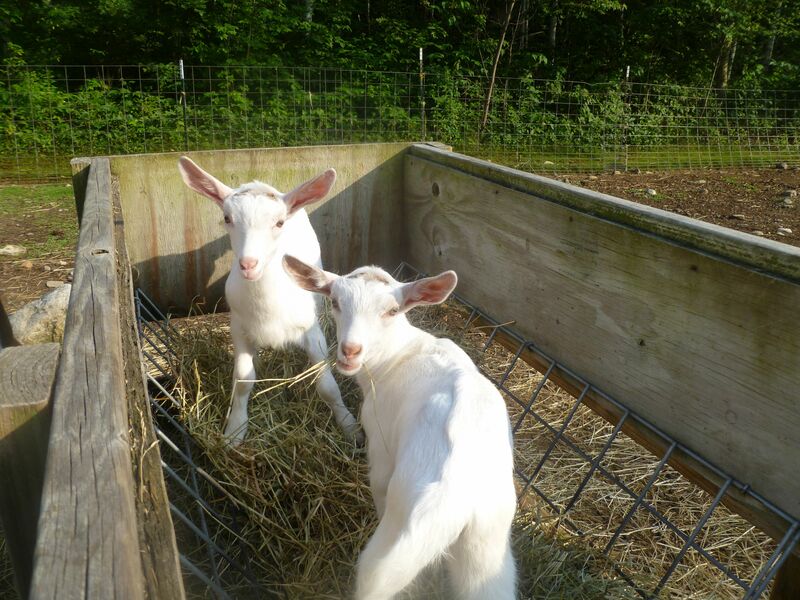 The crazy goat-baby energy has been cut in half, but this is a step forward and I am glad that we have found really good homes for our girls. Big sigh! The interesting thing about these girls is that they both have gigantic ears! We are not used to that with LaMancha goats. 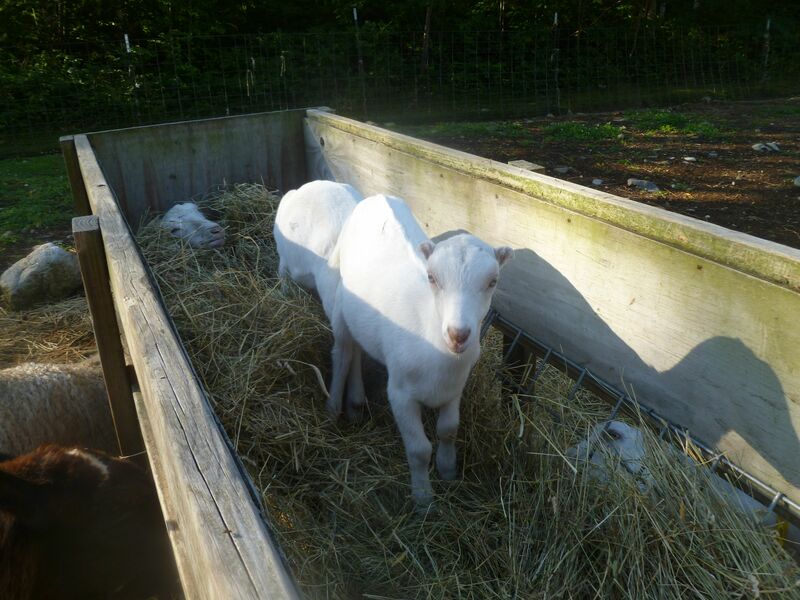 But last winter when we were trying to get them bred, we ended up taking our two girls down to Sea Breeze Farm in Friendship where they have amazingly beautiful Saanen goats. A little bit different, but wonderful genetics all around. And she is on her feet! And number two makes her appearance! Yesterday as we were out getting afternoon chores finished up I went over to watch the goatie girls interacting around the feeder. They weren’t panning for the camera like they usually do. There is almost never a dull moment with them around. They confided in me and were a little miffed that they have been getting such short shrift in the blog these days. I admit, lambing has kind of forced goat business to the back burner, but now that the lambs are all here we are getting ready to think about kidding. Bonbel and Pippi both look like they are probably pregnant, although it’s difficult to tell until the last month. But I guess that’s almost where we are! If the girls were bred by AI (and that’s a really big if), they would be due smack in the middle of Fiber Frolic weekend, June 2nd and 3rd. That would be interesting! John would have his hands full while I am manning the booth in Windsor. On the other hand, as I truly believe, they were bred during their next cycle by our friend’s buck, so they really should be coming due about June 23rd and 24th. This is just about the latest we have ever had kids. I have been drying Pippi off to give her some time before the big event and I hope that she does before she starts bagging up for the new little ones. And then we have to decide if we are going to leave the babies with their moms, or bottle feed and start off the milking season with a big bang :*) Always a challenge and a new adventure! 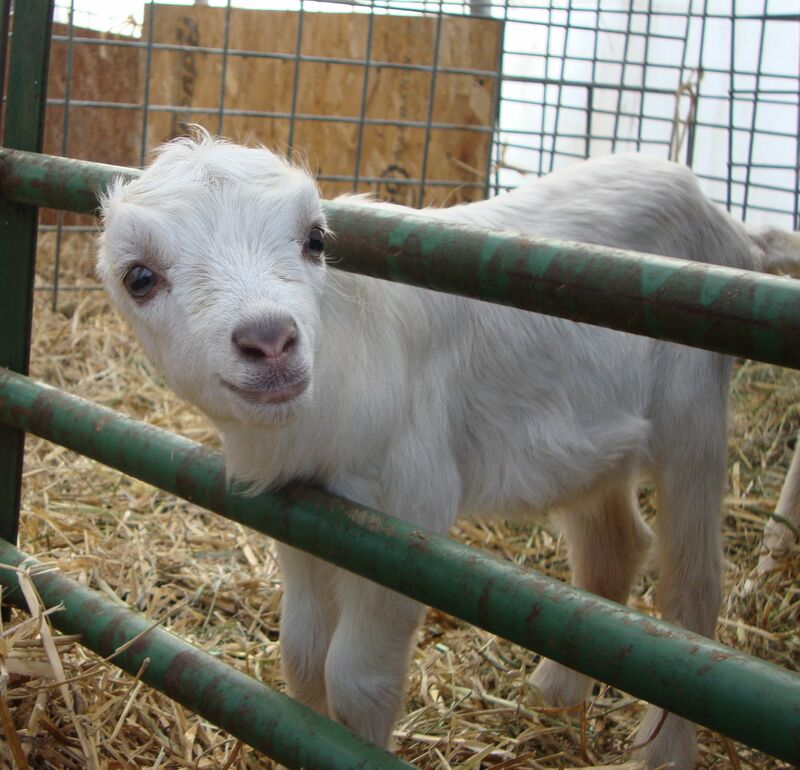 What could be cuter than a baby goat? I didn’t even have the heart to do a blog post on Wednesday evening. All went well with John as he took our girl Pippi to a friend’s farm to be bred by one of his bucks. They got down there, she got bred, they came home. He called me and let me know that things were good and I breathed a sigh of relief. Only to come home Wednesday afternoon and find SnowPea and Bonbel in heat! AARGH! No one settled. It took me a few hours to process that and decide how to proceed. SnowPea is our oldest doe and she has been a very dependable milker, and I am currently milking her in the mornings along with Pippi. 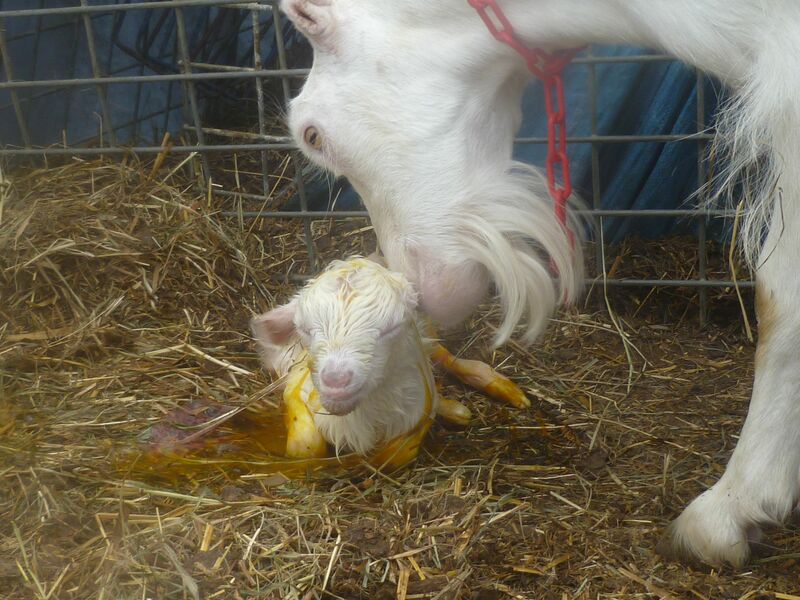 So I chose to have John take the other goat, Bonbel, to be bred on Thursday morning. Things went well again and hopefully we now have two bred and two unbred does. Two is good enough for us to get by with in the milk department, so I am ok with that. I don’t know what I will do if these girls come into heat in 3 weeks, but I guess we will cross that bridge when we get there. I can keep up the milking all the way through with these two if no one ends up pregnant, so I guess I should just keep positive thoughts for now! And so it goes… I was on my way out to feed our little bottle boys on Monday evening and I found that Meadow had had her lambs (I had her penned, just in case). Triplets! 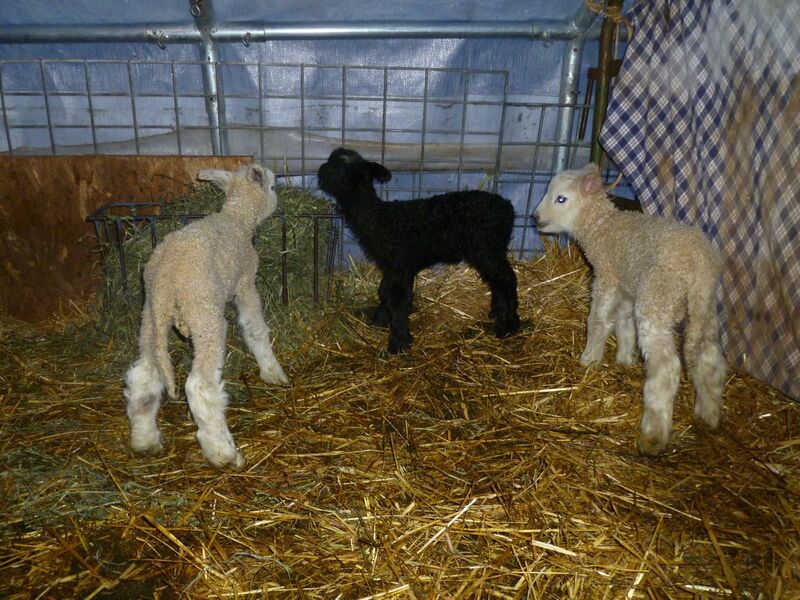 So we have two more white rams, and an absolutely gorgeous black ewe. 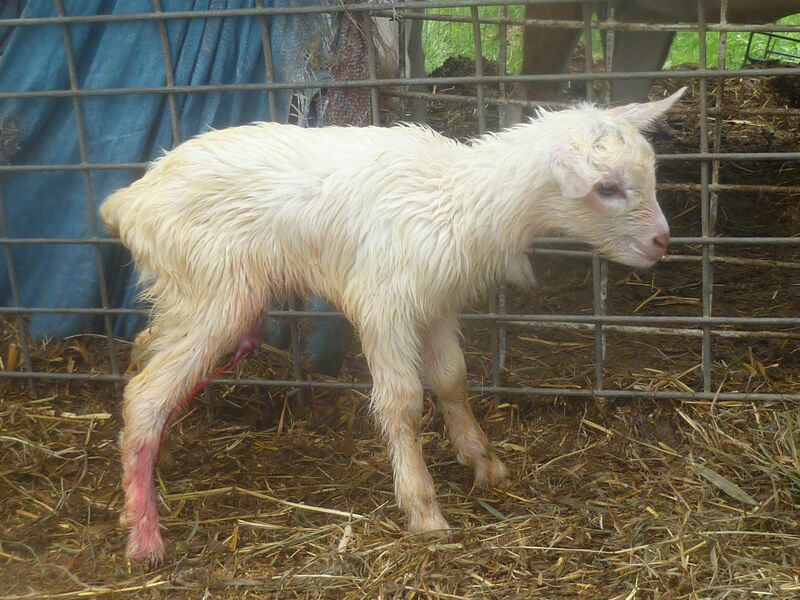 I am really psyched to have a Meadow ewe lamb. 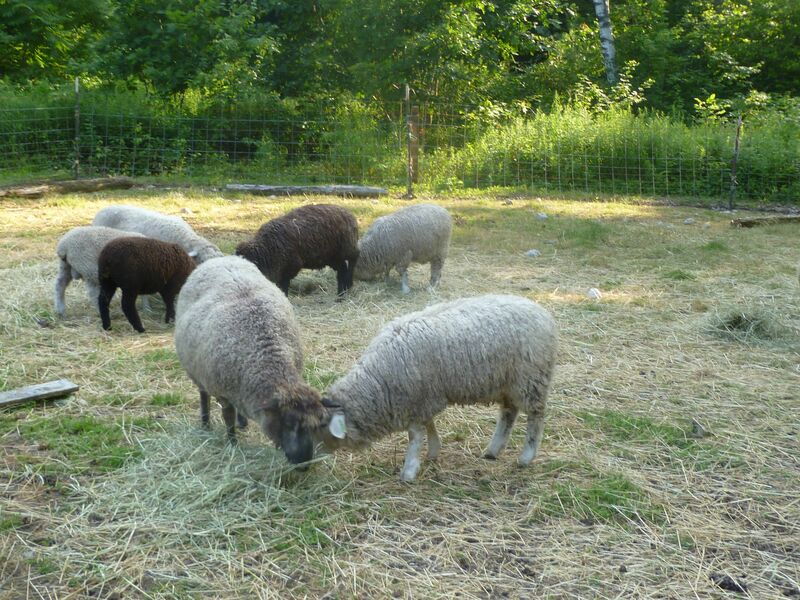 (Last year’s Meadow ewe got crushed in a ewe stampede). As Meadow is getting older, this may be her last year. So I am very excited! And this ewe definitely has her father’s fleece. Large crimp and very dark! Wow! Meadow is a good mama and makes sure that her babies are all getting their share of her milk, but I will have to keep my eye on them to make sure. Today my husband called me at work to tell me that when he was going out to feed Rosie’s bottle lambs, he found our yearling doe, Bonbel, with two little white does. They are beautiful! She doesn’t have much of an udder on her either, so I am going to decide tonight whether or not to pull the babies in and just bottle feed them. It’s nice to have bottle fed milkers as they are easier to handle in the future, but I love to let their mom mother them up as well. Oh well, we shall see what happens. If the two girls lose body temperature, I will haul them in. And I would love to know what the deal is with the goat colors: we get gorgeous bucks of all different patterns and colors, and all the does end up being white!